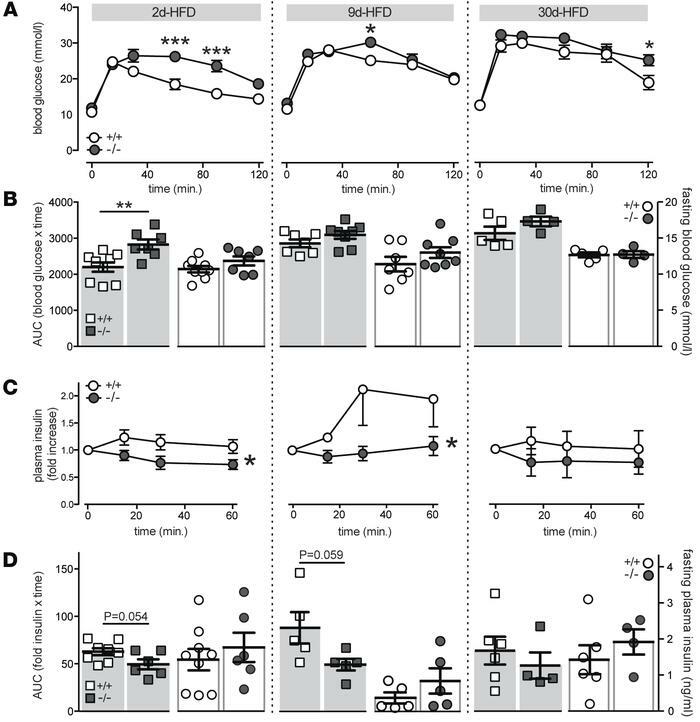 Impaired glucose tolerance and insulin secretory response in Il1r1-KO mice fed a short-term high fat diet. WT (+/+) and Il1r1-KO (–/–) mice were fed a high fat diet (HFD) for 2 (2d), 9 (9d), or 30 (30d) days. (A) Blood glucose measurements following i.p. injection of glucose, subsequent to a 3-hour fast, from WT and KO mice (n = 9, 7; n = 7, 8; n = 5, 4 mice). (B) Area under the curve (AUC) for glucose tolerance tests in A indicated by squares (n = 9, 7; n = 7, 8; n = 5, 4 mice), and fasting blood glucose concentrations in WT and KO mice following a 3-hour fast, indicated by circles (n = 9, 7; n = 7, 8; n = 5, 4 mice). (C) Fold increase in plasma insulin concentrations following i.p. injection of glucose, subsequent to a 3-hour fast, in WT and KO mice (n = 9, 6; n = 5, 5; n = 6, 4 mice). (D) AUC for plasma insulin in C indicated by squares (n = 8, 6, n = 5, 5; n = 6, 4 mice), and fasting plasma insulin concentrations in WT and KO mice following a 3-hour fast, indicated by circles (n = 9, 6, n = 5, 5; n = 6, 4 mice). n values correspond to data points from left to right and to 2-, 9-, and 30-day graphs, respectively. Data are mean ±SEM and were compared with (B and D) a 2-tailed Student’s t-test or (A and C) repeated-measures ANOVA followed by (A) Sidak post-test. *P < 0.05, **P < 0.01, ***P < 0.001 versus WT controls or as indicated.